On the 9th of June, 1862 the first Blaydon race was held. Little did they know that 155 years later a rivalry between two men would literally have 7 other people asking why...what for…and, is it home time? After a short train journey to the central station from the Metro Centre (£2.50, bargain!) we arrived to find hundreds of gazelle like runners going through their warm up routines. Deciding this wasn’t for us, we quickly headed toward the race start whilst suppressing the temptation for a Greggs isotonic pasty. Fun fact: You are never more than 50 metres away from a Greggs in Newcastle! The 7.15pm start time was approaching, and as the Metro Radio DJ turned over his C60 mix tape of the North Easts greatest bands for the tenth time (same on both sides), the bells of St Nicolas’s cathedral rang out, and we were off! The crowd snaked its way up Westgate Road, past the Centre For Life, the Arena and on to the Scotswood Road where, according to the song, “you should have seen us gannin”. At this point I was convinced that I’d left Graham in my wake, so for the next 2.6 miles I could enjoy the sights, sounds and smells unravelling before me. Lite Craft, Toolstation, Tsang foods and Mill Volvo were nothing but blurs as I approached the Scotswood Bridge. It was getting pretty hot in the North East too, highs of 16 degrees proving too much for some. Over the Bridge and on to Chainbridge Road there was still no sign of Graham and only a mile and a half to the finish line. Surely, I had it in the bag! Now I could hear Bridget and the Bangshees beating out tribal rhythms of encouragement. As I approached, a familiar figure had stopped to catch his breath… it was Graham! Somehow, he’d got in front of me!! The Brownlee brother’s act of sportsmanship popped into my mind…should I stop?! NO, this was more important…I picked up the pace (in my mind) and pushed on towards the finish. With only half a mile to go Graham passed me again but didn’t see me! I decided at that point to enter stealth mode and run undetected a foot behind him for the rest of race. A couple of quick pace changes from Graham had me worried but I managed to stay close behind. We turned the last corner past the covers band, who were playing the same song in three different keys, and onto the finishing straight. I waited….. and waited… then at the last 50 meters sprinted from behind Graham’s shadow and crossed the finish line followed a few seconds later by Graham. “Have you been here long! ?” he wheezed. “No”, I replied quietly fighting off a pulmonary. I’m retiring from the Blaydon Race. 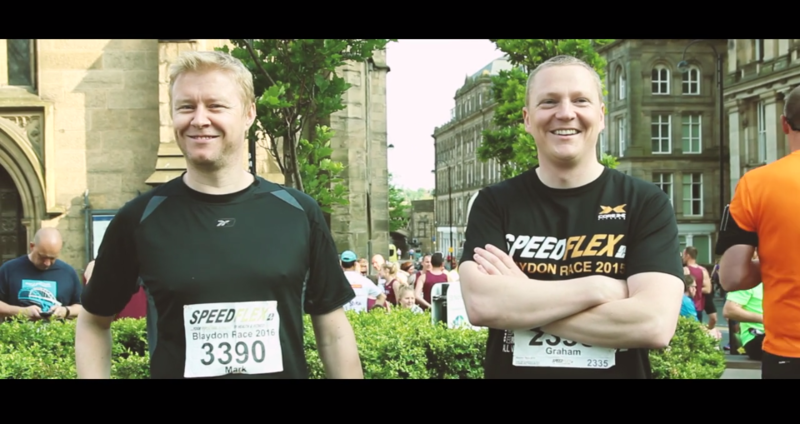 Our Mark and Graham from last years race; They're currently not speaking so no photo for this year!